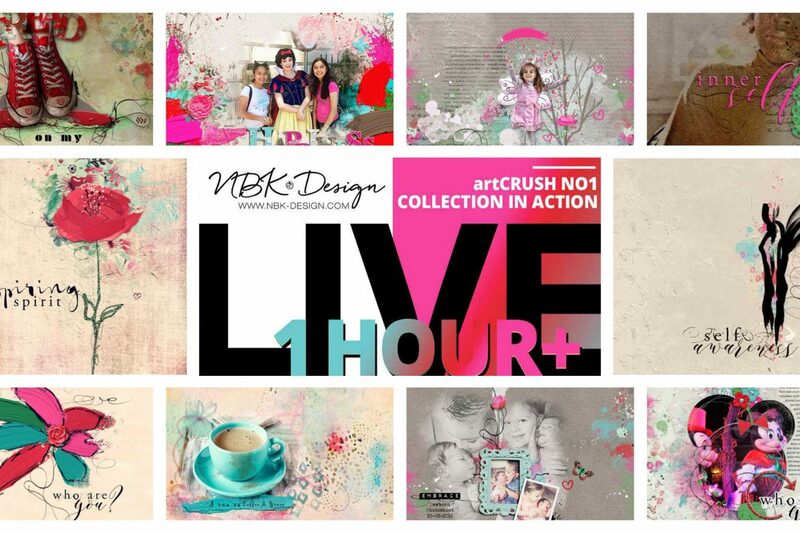 I was able to create a few different Videos for you with my newest Collection artCush No1, which is a part of the miniO January 2018. For only 4 days you get the miniOs for 44% off. Which means that ends January 29th 2018. The second Video is about a new Product I have created Color Adjustment Layers. With them you can change the whole look of your images or Layouts into a retro effect. How to use them and how they work you can see in the next Video. Sometimes Products can be overwhelming or you not exactly know what you can do with them. In my artology group at Facebook I do from time to time some LIVEs showing how to use products and giving you some tricks and tips how to use Photoshop CC. Anika Scrapbee also played with the Collection and created a little Wordflow for you how to achieve the effect on her Layout below! Enjoy! 😉 after 3 petals I selected the complete flower and applied the style. 3. I selected with the lasso a few petals again and applied 3 D pink style. 4. I made a new layer above the flower and grabbed the brush 376 and just painted with the pink from the style a little about the whole flower. optional: I copied the flower layer and put it above the painted layer from No4 and applied a curves adjustment layer and played with the settings of the red/green/blue channel. 5. I put vintage paper No2 on top of all and changed the blend mode to lenear burn. Applied a mask to erase a little bit the paper where it covers the flower. 6. I put the eye from the focus collection 2017 in the middle and on top of the eye from ABP brush 13 and changed the blend mode to colorburn. 7. then I added the wordart labels on top and the hearts which are also from the Focus collection. 9. I made a new layer under the flower layer to make the shadow. Grab a soft brush, opacitiy around 20% and paint the shadow.